Zusammenfassung aus dem Jahr 2017 im Fachbereich Psychologie - Allgemeine Psychologie, Note: 1,0, Rheinische Friedrich-Wilhelms-Universität Bonn (Institut für Psychologie), Veranstaltung: Allgemeine Psychologie II, Sprache: Deutsch, Abstract: Diese Arbeit bietet eine deutsche Zusammenfassung von insgesamt zwölf englischsprachigen, einschlägigen und aktuellen Artikeln im Bereich der Allgemeinen Psychologie II zu Affekt, Motivation und räumlicher Aufmerksamkeit. Folgende Artikel werden bearbeitet: Amodio et al. (2004). Implicit regulatory focus associated with asymmetrical frontal cortical activity. Journal of Experimental Social Psychology, 40, 225-232. Cattaneo et al. (2014). Happiness takes you right: The effect of emotional stimuli on line bisection. Cognition and Emotion, 28, 325-344. Chieffi, S., Iachini, T., Iavarone, A., Messina, G., Viggiano, A., & Monda, M. (2014). Flanker interference effects in a line bisection task. Experimental Brain Research, 232, 1327-1334. Duecker, F., Formisano, E., & Sack, A. T. (2013). Hemispheric differences in the voluntary control of spatial attention: Direct evidence for a right-hemispheric dominance within frontal cortex. Journal of Cognitive Neuroscience, 25, 1332-1342. Elliot, A. J. (2006). The hierarchical model of approach-avoidance motivation. Motivation and Emotion, 30, 111-116. Gianotti, L. R. R., Knoch, D., Faber, P. L., Lehmann, D., Pascual-Marqui, R. D., Diezi, C., ... Fehr, E. (2009). Tonic activity level in the right prefrontal cortex predicts individuals' risk taking. Psychological Science, 20, 33-38. Harmon-Jones, E., & Allen, J. J. B. (1998). Anger and frontal brain activity: EEG asymmetry consistent with approach motivation despite negative affective valence. Journal of Personality and Social Psychology, 74, 1310-1316. Pfattheicher, S. (2015). A regulatory focus perspective on reputational concerns: The impact of prevention-focused selfregulation. Motivation and Emotion, 39, 932-942. Roskes, M., Sligte, D., Shalvi, S., & De Dreu, C. K. W. (2011). The right side? Under time pressure, approach motivation leads to right-oriented bias. 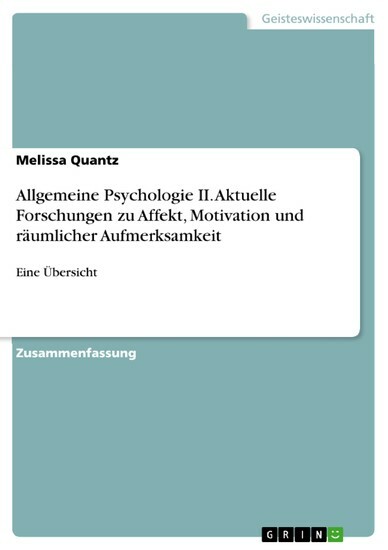 Psychological Science, 22, 1403-1407. de Schotten, M. T., Dell'Acqua, F., Forkel, S. J., Simmons, A., Vergani, F., Murphy, D. G. M., & Catani, M. (2011). A lateralized brain network for visuospatial attention. Nature Neuro-science, 14, 1245-1246. Toba, M.-N., Cavanagh, P., & Bartolomeo, P. (2011). Attention biases the perceived midpoint of horizontal lines. Neuropsychologia, 49, 238-246. Tomarken, A. J., Davidson, R. J., & Henriques, J. B. (1990). Resting frontal brain asymmetry predicts affective responses to films. Journal of Personality and Social Psychology, 59, 791-801.